Artists submitting work for the first time often ask "Do you want me to send my consignment of prints flat?". Customers are curious to know if prints are delivered rolled up or flat too, but nothing beats the intensity of discussion on this topic when two print retailers start talking about which is best! 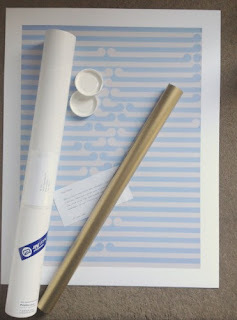 For the record NZ Fine Prints deliver prints carefully rolled in large cardboard mailing tubes. This is despite NZ Post dropping their long-standing cylinder rate which meant we used to be able to deliver nationwide using their extensive network at a price less than the equivalent volumetric ticket. Why have we chosen to roll prints rather than send them flat? Long experience has taught us that a cylinder is stronger packaging. The downside of rolling prints can be mitigated but flat packages are more easily bent or folded by the courier which means we have to replace the damaged prints more often than the rare occasion one of 3mm wall thickness tubes are run over. Although it costs more to send (Airmail is calculated by weight) we use thicker and heavier tubes than those sold by some stationery companies as being suitable for posters or prints in stores (or in Post Shops for that matter). We like to say when asked about how strong our tubes are that they are the same type of tubes that were used to build Christchurch's famous cardboard cathedral! 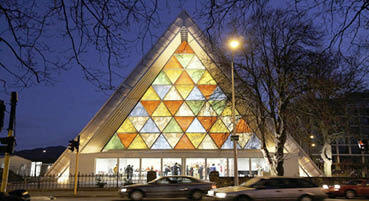 ChCh's transitional cathedral built with mailing tubes like ours! The two drawbacks of rolling prints are that the paper can be creased and the prints can be difficult to remove from the tube once they are delivered to a customer. Avoiding creasing the prints comes down to three things, not rolling the prints too tightly (which means using mailing tubes of a sufficient diameter that the prints are not rolled into an unnecessarily small bundle), rolling the prints gently on a soft surface (we use carpet) and rolling with the grain of the paper, not across it. The last one is the most critical and you can test this for yourself quite easily. Take a piece of paper and attempt to roll it in one direction, then turn it 90 degrees and roll it the other way. One way will be easier, the paper will feel floppier or softer to turn - rolling in the other direction you will feel a resistance - rolling this way against the grain of the paper can easily result in creasing of the paper that is difficult to fix as the fibres of the paper will actually break. The second trick is to make prints easy to remove from the packaging. We wrap the roll of prints in acid free tissue paper - that way they slide out of the tube. Rolling a print or poster and dropping it into the tube without wrapping the prints means they spring open and line the inside of the cylinder. This makes them difficult to remove from the package unless you are very careful and have lots of practice at reaching into the tube, holding the inside corner of the prints very tightly and gently twisting the contents so they contract into a smaller roll inside the tube before sliding the prints out of the tube. This works but it's very easy to tear a corner off one of the prints if the wrong amount of pressure is applied, especially if the print is on a heavy but delicate cotton rag substrate. One of the great things about our business is we are able to recycle nearly all our packaging for incoming prints from artists and publishers. We get some pretty crazy boxes and recycled oddments like downpipes (spouting) and once found an artist's child had stashed a pair of underpants in the tube when Dad wasn't looking! Most artists pack their prints with love as we will send back any prints that come in that have not been packaged to arrive in perfect condition. The weirdest packaging for prints we have ever seen was when our sales manager purchased some exhibition posters designed by a well known NZ artist from the Auckland Art Gallery a few years ago. She asked them to please ship them down to NZ Fine Prints as there were too many to take back with her on the plane. The posters duly arrived in Christchurch a few days later a sad and crumpled mess. The shop assistant had rolled each poster into a plastic sleeve then popped them in a paper shopping bag with a courier ticket on the outside!